Green Smoothies are a hit because it’s a simple, awesome way to increase your energy levels, detox, help restore important lost nutrients and much more. I have been drinking these for years and recommend them to my friends, family and patientss…you can’t help but ‘glow’ when you drink green smoothies. 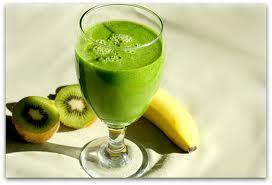 Recipe: 1.5 handful spinach, 1 kiwi, ¼ inch fresh peeled ginger, half banana and cup of coconut water! It will instantly boost your senses, get your circulation going and the ginger will warm you up from the inside out!